For more than ten years we’ve been talking about the Next Tech Bubble. For more than a year, prominent VCs have been warning, begging, pleading for a correction. Astoundingly, bloggers and VCs keep saying we’re in the middle of a correction now. And as always with something as varied as an “economy” made up of hundreds of thousands of ventures that range in size from Uber to Pando, entrepreneurs are feeling all sorts of different realities. Some feel like we’re in the middle of a crash; others feel like 2015 never ended. The difference in your 2016 comes down to one factor: Can you tap into international money or not? Because that’s what the unicorn economy is ultimately coming down to: Trillions of dollars in international cash. This force of capital has spent a decade or longer trying to get into the US startup game and now it’s taking over in three ways: It’s helping push a record breaking year of VCs raising new funds, it’s investing directly in some of the largest US startups, and it’s investing directly in highly sophisticated international competitors. And it’s not done. That’s the sole reason there is no correction yet, and likely isn’t going to be a meaningful one this year. Sure, there will be more bleeding out of companies that can’t make it or Voltron-ing up of smaller players. Companies that have struggled for years, finally winding down and closing their doors. And the same dynamic is in the public universe too: Amazon, Facebook, Alphabet get stronger, as even “winners” like LinkedIn and Twitter look for liferafts to support the weight of tens of billions in valuation. Meantime smaller companies at a “mere” $1 billion valuation-- like GrubHub, like Box, like the newly public Twilio-- just keep their heads down and keep slogging along. We’ve had years of debate by some of the smartest people in the industry over what’s causing an astounding 135 (and growing) “startups” to be valued at north of $1 billion, with a handful constantly setting new all time records for private tech valuations and cash raised. That’s all certainly part of it. But one by one over the last 18 months or so the things that should normally bolster a hot market have begun to fall away. About nine months ago, traditional VCs widely reported they were slowing down their deal making, and the numbers backed that up. Early in 2016, the so-called “hot money” of hedge funds and mutual funds pulled back dramatically from the startup market. And this year has been one of the worst for exits on record, both with IPOs and M&A with a few exceptions. People keep saying we’re about to have a major crash, because those four things should be what props up an inflated startup economy. But there is one thing left that hasn’t meaningfully corrected. One thing that’s behind almost every deal that seems out of place in a year that is supposed to be a “correction.” Foreign capital. A big reason that so many smart people keep missing the call on when this market is going to correct is because most people in Silicon Valley don’t understand international markets. Because until now, many believed they didn’t have to. In 2009, I started work on a book about emerging markets and spent two years traveling around the world doing on the ground reporting. At that time the story of emerging markets and BRICs was long past obvious. You’ve read all the stats before. By 2020, the US would be the only G7 nation that was still one of the largest countries (by population) in the world, said Goldman Sachs. Half of the world’s population was in the emerging world, and half of that group was under the age of 25. It was an unprecedented time of urbanization-- the move from rural Chinese into cities at the beginning of this century alone was the largest human migration in recorded history. An unprecedented rise of young, working people from poverty into the middle class, a trend that we’re still only at the beginning of. And yet, I had a way harder time selling that book to publishers, versus selling another one on Silicon Valley. People thought I was crazy to spend two years outside the Valley in the time when Facebook was in its pre-IPO prime and the mobile revolution was just beginning. Or the argument that markets like China, India, Brazil and Russia have so much corruption, how can you even do business there? A few years after those arguments were made to me by some of the richest, smartest, and most powerful people in Silicon Valley-- and publicly by people like Peter Thiel [disclosure: a Pando investor] and Paul Graham-- emerging market cash is the single biggest force roiling the Valley. Competitors in emerging markets are certainly playing a role too. Consider three of the largest companies in valuation and money raised ever in the history of tech: Uber, Xiaomi, and Didi. A large percentage of the money in these companies is international, without international cash, Uber would have been forced to go public by now. But it’s not only that: The reason Uber’s burn rate is so high is also the rise of emerging markets. It’s the high class, billionaire version of the same new global reality that the US manufacturing industry has already grappled with; the same thing that’s causing the protectionist fear that’s enabled the rise of a presidential candidate like Donald Trump. It’s no wonder people like former Secretary of State Condoleezza Rice are serving on tech boards, and a big chunk of the staff from the Hillary Clinton state department is now working at privately held tech companies. It’s no wonder Uber counts the former head of the CIA on its staff. Tech companies launching in the last eight years or so had no clue the fight they were getting into. In an interview with the Financial Times last week, Uber’s Travis Kalanick likely stretched the truth with his claim over the company’s “profitability” in developed markets, but he honestly articulated this company’s biggest catch-22: China is its largest market by rides, a full third of its volume. And yet, China is bleeding Uber-- an otherwise thriving company-- out of billions of dollars a year just trying to maintain a minority market position. That’s all because the local competition has all the sophistication of a US company and greater cultural advantages. And without international money, it couldn’t keep fighting there. Uber is being at once inflated by and destroyed by a global battle that no Silicon Valley company has ever truly faced this young in its life. It makes companies like Facebook that simply got banned by the government look lucky by comparison. And the so-called “gatekeepers” of startups, the VCs who once controlled the pursestrings, the boards, and made the bulk of the capital when these companies won are left powerless and shrieking on the sidelines. Please stop raising sovereign wealth money! Please go public! 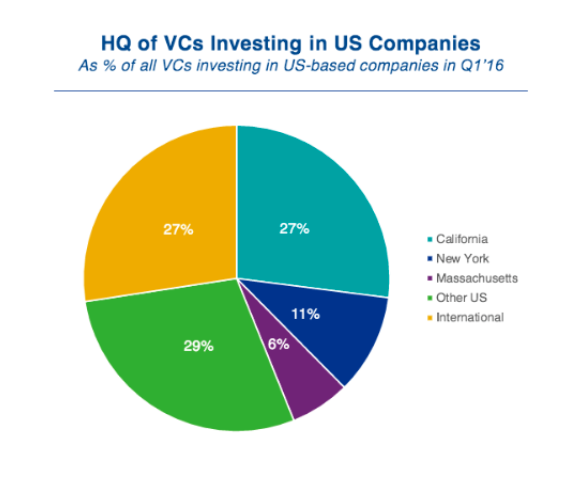 In reality venture capital has become a very small percentage of the money in these decacorn deals. It’s like the country's best junior high basketball team was locked in a playoff game, and the Cavaliers and the Warriors just stormed on the court stealing the ball. This isn’t just about Uber. We’ve reported before that international cash is as great a source of funding for US startups right now than money coming from California. And that’s to say nothing of the cash going to companies who aren’t based in the US. Bear in mind, this is in a time of record breaking fundraising by US venture firms. This isn’t a cyclical change, it’s a systemic one. In 1999, there was a systemic change. The Internet along with a huge amount of retirement money moving into 401(k)s and a greater democratization of the stock market created an ability for very young companies to tap the publica markets sooner than ever before. In 2008, the mortgage bubble was caused by “the innovation” of mortgage backed securities. This time around, it’s a force of international cash investing directly in the biggest US companies and their global competitors. Those same VCs saw this coming: All that international cash has been trying to wedge itself into their funds for the last 15 years. There isn’t close to enough capacity. So all that capital is just investing directly now. VCs still control the beginning of a start ups journey, who gets funded, who gets another chance when they fail. They are hardly irrelevant. But they don’t have close to the level of say they have historically when it comes to the biggest companies. This will all shake-out at some point. But we’re nowhere close to that happening. There’s too much capital all over the world, and even in risky markets like China, a lot of it is in people’s savings accounts. I don’t pretend to know what an eventual reckoning will look like. I spent more time in emerging markets, than most people investing in these companies, and I wouldn’t have predicted what’s played out with money going into and coming out of Uber either. I just know it’ll happen, and I know most Valley VCs don’t have a clue how it shakes out either. In 2007 or so, I did an interview with [disclosure: Pando investor] Marc Andreessen-- well before Andreessen Horowitz the venture firm even existed-- where he talked about missing the beginning of the Web 2.0 wave. He talked about the hardcoded human evolutionary wiring that means we're always looking for the predator that came after us last time. Staring at the horizon, waiting for that lion to come over the hill. He said that he and many others got so decimated from the dot com crash, that they were convinced a lion was coming over the hill again. But the world had changed. The Web was larger. Revenues were there, and the cost of building companies was cheaper. The lion wasn't coming. But that doesn’t mean there was no “predator.” You could argue this crush of international cash, growth of their domestic markets, and growing sophistication of international entrepreneurs was the dragon sneaking up on us from the left. For the first time, it’s not up to the Valley or even Wall Street if the Valley crashes. Those predicting the startup economy are going to have to understand global finance before they can make any meaningful predictions about what’s happening in our own backyard.